COLOR(S):Black, blue, red, and reddish brown, with tan markings. 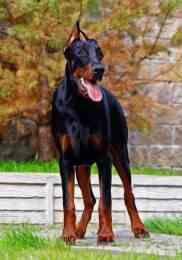 The Doberman Pinscher is compactly built, muscular, very powerful. He is elegant in appearance, of proud carriage, reflecting great nobility and temperament. They are proud, alert and athletic, with endurance and speed. Devoted and fearless, the Doberman Pinscher is universally known as a "police dog" for its duty on the German Front during World War I. An excellent breed for a jogger to own, he may be a challenge because of his dominance for the elderly or disabled. The Doberman Pinscher is a highly energetic, bold, fearless, alert, fearless and determined dog breed. Initially suspicious of strangers, the Doberman Pinscher is a great guard and watchdog. He is very intelligent and easy to train. Loyal, noble and affectionate with the family. All family members should learn to handle the dog properly, as Dobermans can be pushy if allowed to have their own way too much, not recommended with children and will not tolerate roughhousing. The Doberman is naturally protective and does not need additional "protection" training to be a fine guard dog. These dogs are like big, protective babies. Doberman Pinschers have many talents including tracking, watchdogging, guarding, police work, military work, search & rescue, therapy work, competitive obedience and schutzhund. Aggression towards other dogs is accepted in the AKC standard. Doberman Pinschers require minimal grooming. Occasional brushing or wiping of the coat with a damp cloth will minimize loose hair. Dental hygiene is crucial to prevent early tooth loss. It is also important to keep their nails trimmed short. Bathing or dry shampooing should only be done when absolutely necessary. The Doberman Pinscher is prone to Wobbler Syndrome, Von Willebrands Disease, bloat, hip dysplasia, and congenital heart disorders. They do not do well in cold climates. Highly energetic, Doberman Pinschers require daily extensive exercise and stimulation. They enjoy family play sessions and make wonderful walking companions. This breed will do okay in an apartment provided they are sufficiently exercised. However, a securely fenced yard is best for romping and running freely. The Doberman Pinscher is easy to train but requires a dominant owner. Early socialization and obedience are crucial to prevent shyness, timidity, and aggression. They will not respond to harsh or heavy-handed methods. This breed does best with positive reinforcement, firmness, fairness, consistency, and respect. The Doberman Pinscher excels in competitive obedience, schutzhund, tracking, search and rescue, police work, and as a therapy dog.